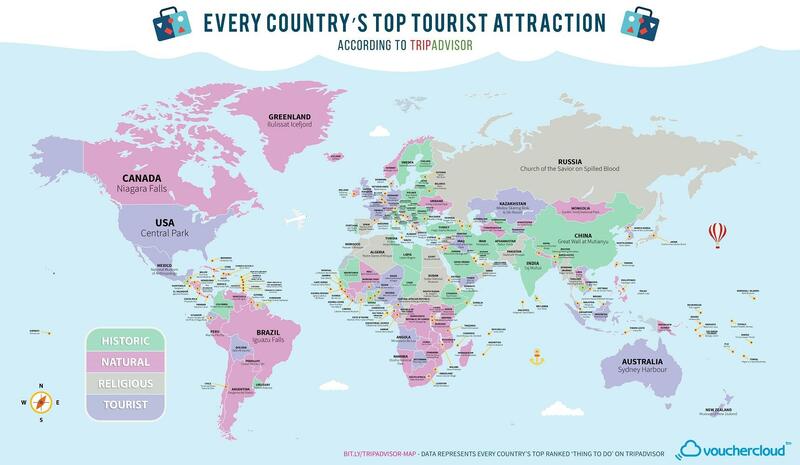 A new map picks one attraction in each country and territory that you should not miss. The choice for Vietnam is not a surprise. U.K. travel site Vouchercloud just rethought the world by mapping each country and territory by the one place you must see (or the one thing you must do). We can probably call them the tourism capitals. The map shows the top rated things to do, according to TripAdvisor travelers, and some picks are really spot-on. Everybody loves the magnificent Angkor Wat in Cambodia or the Sydney Harbor in Australia. Yet there are clearly questionable picks. A Harry Potter tour is a best thing to do in England? The tourists on TripAdvisor must have been under a spell of some kind. For Vietnam, it’s kind of sweet and sad to see only one top place on the map. Hoi An is a well-preserved ancient town that every tourist should visit at least once. There are indeed so many things to enjoy: colorful traditional lanterns that glow up the streets almost every night, centuries-old houses, excellent tailor shops, beautiful beaches and amazing food. The town has also just entered the TripAdvisor list of 25 top global destinations for 2017. But it would be a waste if you only travel to Vietnam for Hoi An. Because if you ask any visitor who has been here, they will give you so many options that will leave your head spinning. 1. A walk in Hanoi’s Old Quarter. The over 1,000-year-old city was one of the top 10 global destinations according to TripAdvisor travelers for three consecutive years 2014, 2015 and 2016. 2. A cruise trip in Ha Long Bay, a natural wonder. 3. Exploring a cave in the central province of Quang Binh, and check if you can roar like Kong. 4. Climbing up the Indochina rooftop Fansipan in Sa Pa. Otherwise, try cable cars. 5. Squeezing down Ho Chi Minh City’s Cu Chi Tunnel, if you are not claustrophobic. Or just stay above the ground and enjoy the city’s sidewalk cold beer and banh mi. Even if life is short, your trip to Vietnam doesn’t have to be. And trust us, you definitely should not miss Paradise.